The barrel knot has the same advantages as the flat overhand (pulls over edges easier and is quick and simple to tie) without the finicky nature and tendency to fail. How right he is. Once past the beginner stage, everyone can enjoy the game together. Timid, once a year skiers can take a ski holiday with their expert friends and enjoy runs together and parents and kids can both have a raging good time on the same terrain. The great equalizer is the combined forces of gravity and the ski lift. Modern ski gear makes it even better. More people can have more fun skiing than ever before. The gear has gotten so good that the “handicap” Klaus is talking about even applies outside the ski area. Backcountry skiing is exploding in popularity, and the easy to use, lightweight equipment is no small part of the reason, but the removal of the lift and the ski patrol raises the bar considerably when it comes to enjoying the game safely with people of different ability levels – especially with kids. But it can be done, and done safely, if you pick the right objectives and have the right attitude. Pick the right terrain and a beautiful day, and kids go nuts over ski touring. Over the last few winters we’ve slowly been figuring out how to enjoy the backcountry with our twins. With virtually zero information available on how to do it - a striking void in the information age - I thought other people might like to know what we've learned. There are three enormous considerations involved in taking kids into the backcountry: the logistics of skinning up and skiing down with kids, cost and availability of equipment, and the nightmarish risk of avalanches, tree wells and cold. These issues beg the question: Would a responsible parent take their kids ski touring? When we started playing with the kids on skis outside the ski area, I didn’t really know the answer. I was in no hurry to take my kids “backcountry skiing” and didn’t really have a clear idea of how it could be done safely and enjoyably. It just evolved. 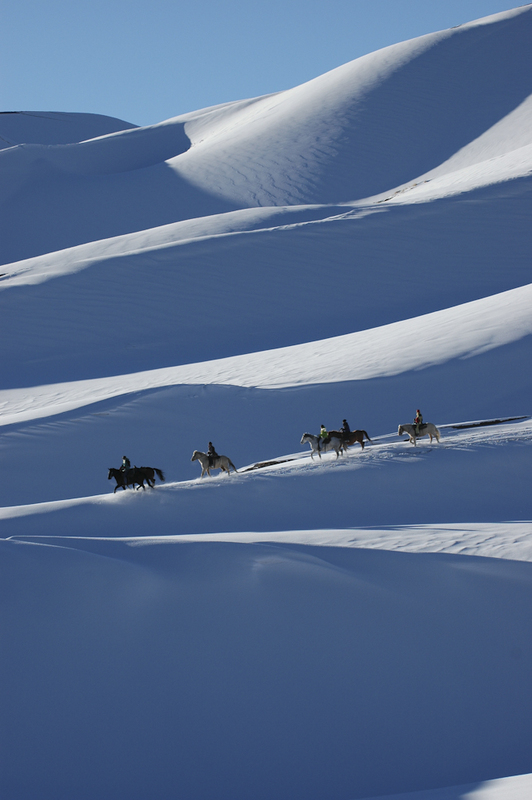 In the beginning, we didn’t do what I would consider ski touring. We called our outings “ski hikes” and we started on plastic, cheapo cross country skis when the kids were 3 years old. We’d go to a place with some mellow terrain and let the kids stagger around with skis on their feet. They’d slide down little hills, fall over, cross tips, get frustrated, giggle, drink hot chocolate, and snack on elk jerky; there was precious little skiing involved. Ski touring can get miserable quickly - be ready for anything and don't get too far from the car. As the kids got older, we started doing mini car shuttles, driving to the top of a snowy hill and skiing down. Often the snow was too deep, too shallow or simply heinous un-skiable crud for the little legs and skills and we’d end up just playing in the snow. This year, everything changed. They got heavier and strong enough to push through powder and their skills were up to the challenge after getting to the point where they were comfortable on almost all in-bounds ski runs. The 4500 Contour Startup binding clips into a downhill binding for the uphill, and then is removed for downhill shredding. Part of the breakthrough was that I stumbled across an equipment solution that wouldn’t break the bank and made the logistics of ski touring with kids a reasonable proposition: the 4500 Contour Startup Ski Touring Adaptor, available from Camp in the US for about $150. The Startup works similar to the Alpine Trekker in that it simply clips into a downhill ski binding, but is much lighter. The device is then removed for downhill skiing. For skins, we have a few old pairs of skins lying around, so we cut a couple of pairs to fit the kid’s skis – with about a foot leftover to accommodate increases in ski length from year to year. Then we wrap the extra around the tail of the ski and secure it with athletic tape. A tail kit could be installed as well, but for a lap or two, tape works fine. · Go for a very short tour the first couple of times so the kid’s feet and muscles can adjust to the strain of carrying the skis and their skin can toughen at the inevitable places the boots will rub against the feet. Then there’s the downhill part. Backcountry skiing is synonymous with avalanche danger and the consequences of getting caught are so severe that it calls to question the entire concept of ski touring with kids. Avalanche forecasting is a complex and inexact science even for the world’s best. Ongoing assessment is so critical that some ski guiding companies run their schedule with overlap between the guide teams so someone on the team has always skied the day or week before. The point is, developing adequate intimacy with snowpack structure to make decisions about venturing into avalanche terrain safely with kids is beyond the capability of 99.9% of the backcountry skiers out there, myself included. Skins off. Time to rip it up. Get a face shot like this when you're 8 years old, and you'll never look at skiing the same. This was on a 10 foot tall steep section on a longer mellow hill. When considering the right kind of terrain, look for the kind of features where you would take kids sledding or playing in the snow; the kind of slopes where you’d be safe living in a tent all winter long, even during periods of extreme avalanche danger. Look for short hills and low angle meadows with no threat from above, not proper ski objectives. Check the local avalanche forecast to see if things are exceptionally dangerous. Unless hazard is so extreme that you should be worried about driving the car to the pass without getting buried in an avalanche, even inexperienced backcountry skiers can avoid trouble by religiously following one simple rule: stay out of avalanche terrain. When you're only 4 feet tall, waist deep comes a lot more often, and you don't need to be in avalanche terrain to make some great powder turns. We sometimes let our kids wear our avalanche beacons because they like playing with them and doing searches for fun, but most of the time while skiing with our kids we don’t even carry avalanche equipment and instead keep a large buffer between us and avalanche terrain. Go skiing with kids in picnicking and camping terrain, not real skiing terrain. By all means, carry transceivers if it makes you feel better, but don't ski more aggressive terrain because you have them. The final step to staying out of avalanche trouble is to take your own preconceptions about quality skiing out of the picture. For kids, even straight-lining down a 15-degree meadow of boot-top powder is an incredible experience. A 10-foot tall rollover of champagne pow can provide a kid with a face shot that hooks them on powder skiing forever. And just being out in the winter woods, even within sight of the car, is an eye-opening wilderness experience for a little kid. Tree wells and shallow snow are another hidden danger. A wide open glade of 20 degree powder is all you need for a fresh tracks extravaganza. Although helmets are not as common in the backcountry, cross country skiing or snow play, it's always smarter to wear one. The next time we went out, we took helmets. · Use mittens rather than gloves. Better yet, choose only the nicest winter days to take the kids into the backcountry. Springtime, with a nice fat snowpack and a few inches of fresh pow, is the ideal time of year to introduce the little ones to the magic of the backcountry. If you’re gonna take kids skiing outside the ski area, keep it really fun, really low-stress and really safe. On second thought, keep it that way in-bounds too! A few years ago, an Alaskan climber named Sam Johnson contacted me for info on climbing in the Neacola Range of Lake Clark National Park. In 1995, my frequent partner in climb, Kennan Harvey, and I went in there to try the North Face of Mt.Neacola, the range’s namesake. Photo taken by Sam Johnson of the Medusa Face of Mt. Neacola showing Harvey/Donahue line and high point. 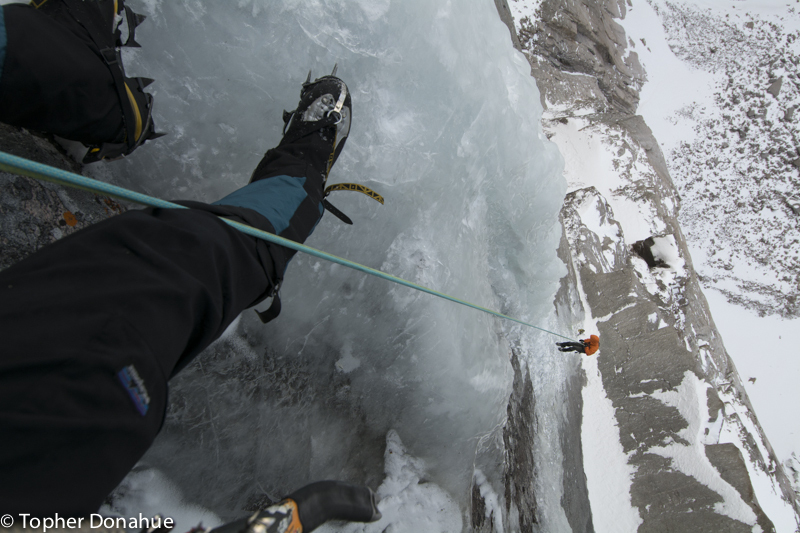 Kennan had climbed the first ascent of the peak a couple of years earlier with none other than the Legend himself, Fred Becky – although Fred was sick in basecamp during the ascent so Kennan and two other younger climbers bagged the FA via an ice climb on the south face. Durning poor weather, Kennan skied around to the north side of the peak and discovered the enormous north wall. Sporting 4500 feet of steep and technical terrain, Kennan was blown away and it didn’t take much convincing for him to talk me into going back with him for a go on the unclimbed face. I was 23 years old at the time, and the peak was the thing young alpinist’s dreams are made of - remote, hard, unclimbed and unknown. Perfect. The Neacola range is a phenomenon of compact, complex terrain, with steep, pointy summited peaks rising from small and convoluted glaciers. We flew out of Kenai with a pilot named Doug Brewer and were dropped on a glacier we named the Lobster Claw for its distinct shape on the map. For the first time in many alpine adventures together, Kennan and I decided it would be a good idea to take a radio. As Doug flew away after dropping us off, Kennan tried the radio. Nothing. It didn’t work. Should have done the radio check while Doug was still on the glacier. Oh well, situation normal. No radio. It stormed for all but one day of the next 25 days. We mostly skied our brains out, bagging peaks and skiing steep faces and tight couloirs on untouched peaks. When our pick up date was nearing, we decided to go climbing in the storm just to see how far we could get. The weather did improve a little, and after a couple of days of dragging a haul bag and portaledge up a complex alpine wall, we got sick of big wall style and decided to just go for a single push as far as we could from our portaledge camp 1500 feet up the wall. For 24 hours we sorted through some of the most difficult and diverse climbing either of us had ever done or ever will do. Tricky aid, hard free climbing, steep ice and bizarre route-finding kept us focused like racecar drivers for hours on end. One pitch in particular stands out in my mind as if it were yesterday instead of 20 years ago. I removed my crampons for tenuous aid climbing off the belay, and after 40 feet of A3 insecurity I placed a good piece of gear below a free-hanging dagger of ice. In those days, climbing free hanging daggers was not yet standard fare even at a crag area, let alone a half-mile off the deck, with another 1500 feet to the summit. I’ll never forget putting my crampons on from my last aid piece and chipping delicately up the dagger onto steep ice above. 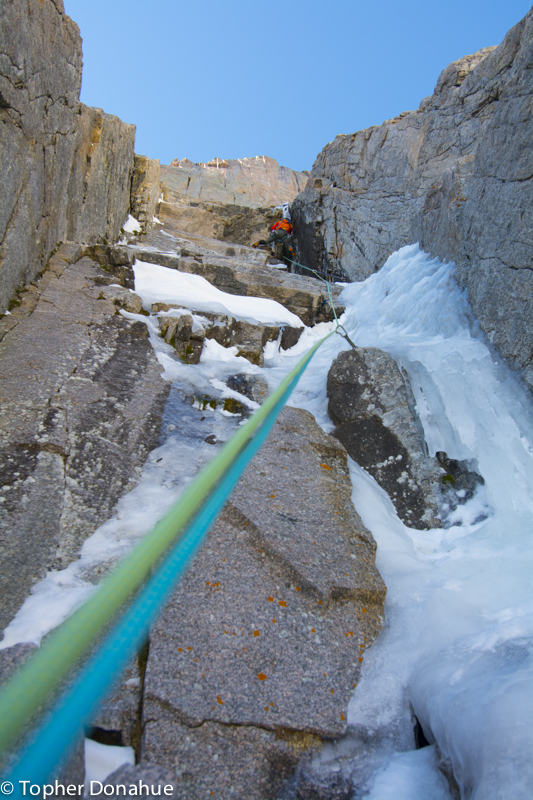 When the ice ran out, an overhanging corner of technical stemming took me to the end of the rope. I’d just used every climbing trick I knew in a single pitch of climbing. With the summit ridge less than a pitch away of easy terrain, the weather deteriorated into a spindrift nightmare, pummeling us for hours. Our bivy kit consisted of a down jacket and a bivy sack. Kennan took the jacket and I took the sack. We stood on boot-sized ledged chipped out of the ice all through the thankfully short Alaskan spring night. When it was light enough to climb again, we made one of those decisions we’ll always wonder about – could we have made it? The weather was dismal, and Kennan’s hands were too cold to even rig his rappel device. Maybe we could have made it, but had we not made it, I wouldn’t be here today to share the story. We were really far out there – farther than I’ve ever been in my life. Nearly 3000 feet above our portaledge, in the middle of a mountain range nobody even knew about, with no way of contacting even the one guy, our pilot, who knew where we were. We decided to go down, and rappelled into the whiteness. Upon reaching the portalege, we collapsed for a full day before we had the energy and hydration to continue down the wall below. This year, Sam made it into the Neacola Range and took some photos of the face Kennan and I tried. In the process of online discussion with Sam and his friends, they asked if we had any climbing photos from the ascent. I was about to scan some of my slides, but decided for a more fitting way to share the experience and the world of adventure story-telling before Facebook, Instagram, GoPros, drones, and even the Internet, I would photograph the slides themselves. The Corset Ranch, a Colorado Centennial Ranch, is now officially organic! Reports from an exciting new trad climbing coaching program. Went into the Indian Peaks yesterday with a pack full of crampons and ski boots, water and gloves, two 7 year olds, their mom, and a bag of elk jerky for family style alpine climb. Not sure what it is about kids and adventures, but they sure do like 'em! 7-year-olds on a rope - putting "short" in the technique of short roping. First belay - the marmot den. At least she's armed! The crux headwall around the marmot den. Back on lower angled terrain, Aya gets her jib on. The Front Range of Colorado doesn't have the world's best skiing, ice climbing or rock climbing, but the fact that we can do all 3 sports and more, in a single morning, says a lot. I've always thought that you can do more outdoor sports on more days of the year in this area than anywhere else I've ever been. 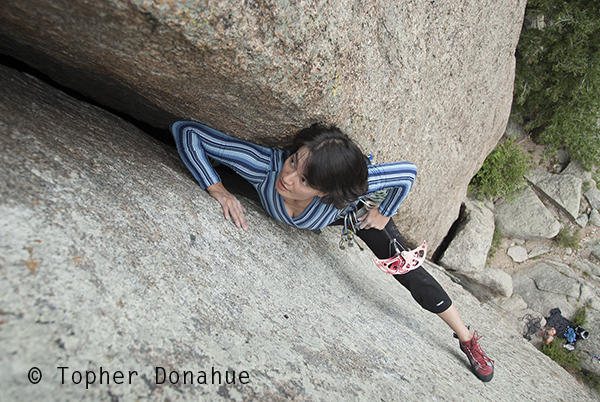 Here's a video of a boot's perspective on a recent multi-sport day in the Indian Peaks. Thanks to Scarpa for the bomber footwear. Papa, when can we go ice climbing? What happens when you take a 6 year old girl ice climbing? Some are calling Colorado’s flood of 2013 a thousand-year flood. Others are saying it was a 25-year flood. 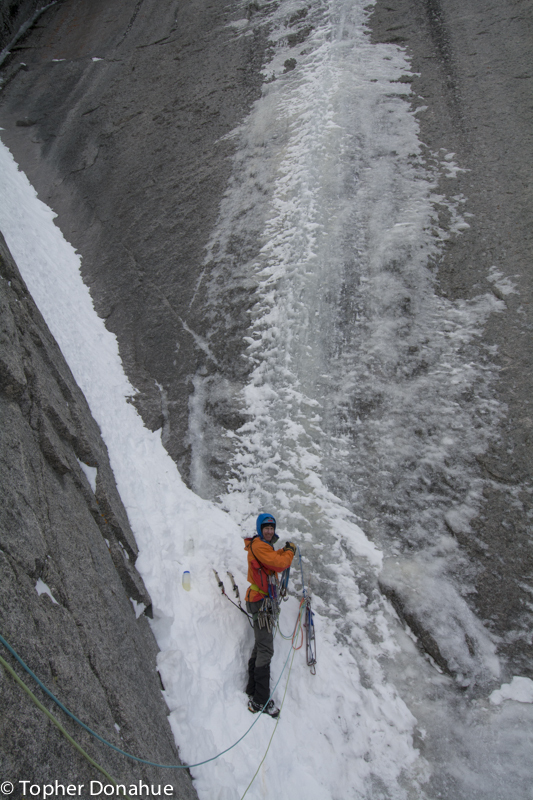 However you measure it, with a cool October following a record-breaking flood, the ice climbing in the high country is the best it’s been in over a decade. Approaching the Longs Peak's East Face, Smear of Fear on the left. After 15 years of watching the smear that forms occasionally on the left side of the Diamond, near the airy natural arch called the Window, Kevin Cooper and I decided the time was ripe to give it a try. We climbed the Smear of Fear in late September, tuning up our minds and bodies for the thin and steep. After climbing ice a grand total of one time in the last three years, I was happy to get in at least one climb before diving into hard climbing at over 4000 meters. The Diamond, with the Window Pain smear visible on the left with a sunbeam passing through the Window. Conditions were ideal, starting with a moonset over the very top of the Diamond as we approached the wall. Sticky but cold ice and attention getting mixed climbing in Field’s Chimney made up the first 600 feet. From Broadway we still couldn’t tell if the “Window Pain”, as we’d started calling it, was going to in. Even 8 feet of blank rock or paper thin ice at the bottom of the smear would shut us down. The Window in sweet conditions. The traditional Window route, however, was in fantastic condition. Thin, well-bonded runnels and smears with good rock protection brought us to the ramp below the unclimbed smear. I moved the belay onto a tiny perch at the lip of the Window ramp so I would be out of the line of fire while Kevin prepared for the hardest lead of his life. The exposed perch provided a solid rock anchor and an incredible perspective to photograph Kevin as he put together everything he’d learned in 20 years of unadulterated ice-fiend behavior for a lead neither of us will ever forget. Kevin Cooper psyching up to open the Window Pain. Just following the pitch at that altitude delivered a mighty pump. In this photo I think I’m smiling so big in part because I got to top-rope it! We left a cam anchor happily at the top of the smear, called our families to tell them we'd sent it, and rapped for home..
At some point in the previous few days, another party had climbed to the bottom of the crux smear, leaving a couple of V-thread anchors. They bailed from there, leaving the smear untouched. Their anchors saved us precious time (thank you!) which allowed us to get to the regular rappel route and reach bottom of the face just as darkness engulfed the cirque in pitchy blackness. All that remained was a long, dark stagger and a couple of dark Irish beers. The one little bright spot in Colorado floods – tons of water in the high country that is now turning to ice – just got snuffed by government bickering. Our state is in chaos, and the Feds now close our National Parks. M#$%*r F#&!#@s! The most exposed wedding portrait ever? Krystal did an awesome job of being patient with her flowing bridal gown, waiting for the updraft to blow the dress in a way that would reveal the next foothold, not freaking out when a few drops of water blew onto us from the waterfalls on the right side of the face, and generally keeping it together on lead in a wedding dress nearly 3 miles above the sea and a half mile over the talus. The only fish we saw were floating down the river - belly up. Even the black lab, Luna, didn't want to get in the black water. Not a good sign when a lab avoids the water. Boulder County Open Space closing Boulder's nicest trail? Some have called the Black Canyon the Verdon Gorge of America, but I'd say it's more like the coyote date of American climbing. A bad day can be like waking up after a one-night-stand that makes you want to chew your arm off rather than wake your partner in sin. 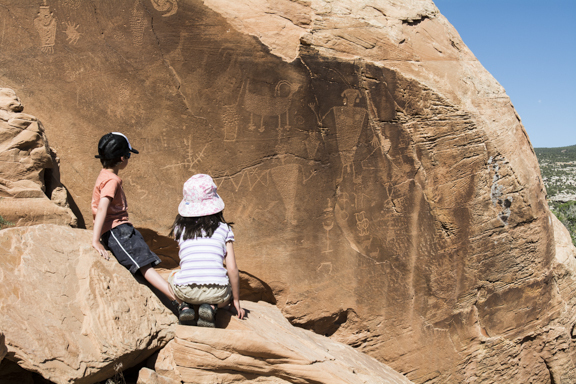 A 200,000 acre slice of the finest wilderness in the American west that somehow remains off the radar for all but a few parents taking their kids to see the fossils.